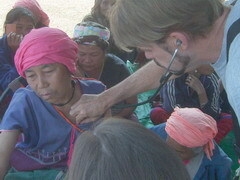 This year Mr. Friedhelm Metzger brought fifteen friends with him, making our largest medical team from IPHC (Introduction To Primary Healthcare) of University Of The Nations, Hawaii. 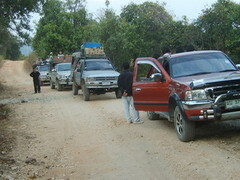 So we needed four 4-wheel drive trucks, five interpreters and our own chef to manage the trip, serving at seven different villages. 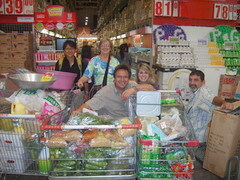 Our old friends who had traveled with us before included Friedhelm, Carol, Jennie, and Mordecai. 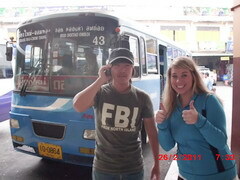 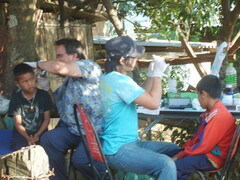 Our new friends on this trips were Dr. Mike, Karen, Sam(Mike), Alexis, Sam(Korea), Ellen, Allie, Phaby and Dr. Viola. 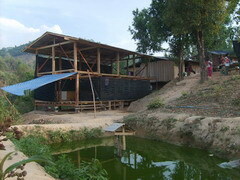 ปีนี้คณะให้บริการทางด้านสุขภาพค่อนข้างใหญ่ คุณฟรีแฮม พาเพื่อนอีก 15 คน จาก IPHC (Introduction To Primary Healthcare), University Of Nation, Hawaii การเดินทางครั้งนี้จึงต้องใช้รถกระบะถึง 4 คัน ใช้ล่าม 5 คน และแม่ครัว 1 คน การออกบริการชาวบ้านครั้งนี้เรา เราสามารถให้บริการกับชาวบ้านได้ 7 หมู่บ้านด้วยกัน ในทริปนี้มีเพื่อนเก่าที่เคยมาได้แก่ Friedhelm Metzger, Carol Eagle, Jennie Lee, Mordegai and Melissa, ส่วนเพื่อนใหม่ ในครั้งนี้ได้แก่ Dr. Mike, Karen, Sam(Mike) Alexis, Sam(Korea) Ellen, Allie, Phaby and Dr. Viola. 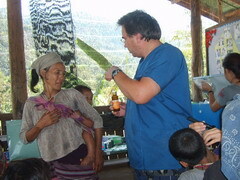 Friedhelm had left some medicine from his prior visit, to use this time. 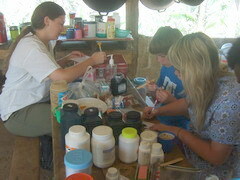 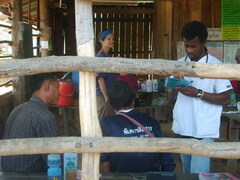 When he arrived this year he checked those medications to determine what else was required for our pharmacy supplies. 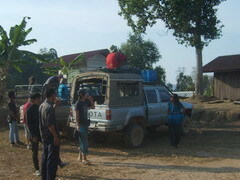 This trip was planned for fifteen days, in some remote areas, so we had to carry sufficient food and supplies. 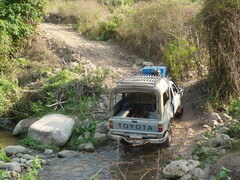 We had limited budget so we arranged for most of the team to travel to Omkoi by bus. 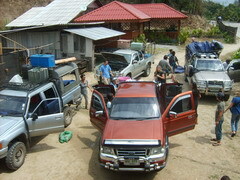 Most of luggage was carried by “Miracle” (our truck). 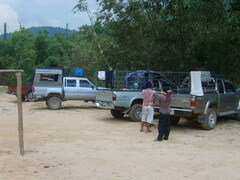 An additional three 4-wheel drive trucks joined at our center in Omkoi. 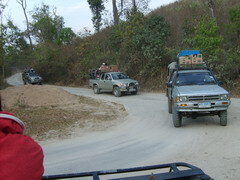 When we reached Omkoi the luggage was dispersed to other trucks also. 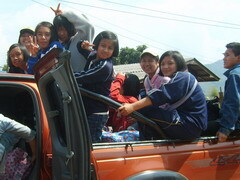 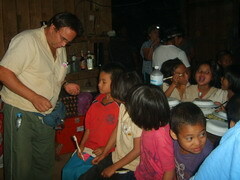 This was the first trip with hostel children also traveling with the medical team. 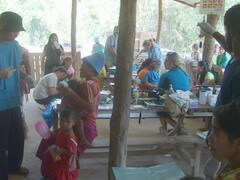 Our purpose in taking the children with us was to help the medical team with cooking and various tasks, and to sing at Pa Ki Kee village for the Sunday service. 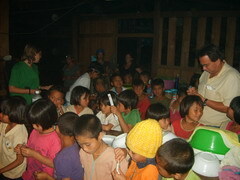 The children could go along because it was Saturday, and the distance was not too far. 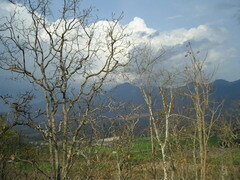 We left Omkoi at 3:45 PM, stopping by a viewpoint for a few minutes. 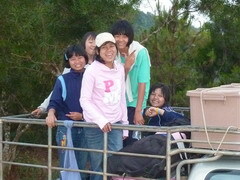 We reached Pa Ki Kee at 8 PM. 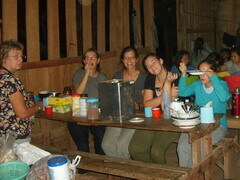 Our chef, Anna, started her first meal for this trip, with the children from Omkoi Coffee Hostel helping her. 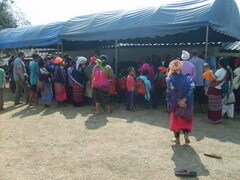 The first meal was difficult because the one cooking had not done the shopping, so the chef was not sure of availability of foodstuff and seasonings. 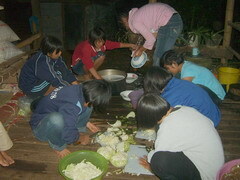 Dinner was ready at 9 PM. 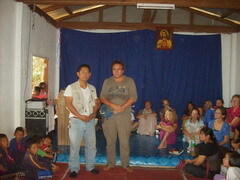 There was a church in this village, so we joined church service there. 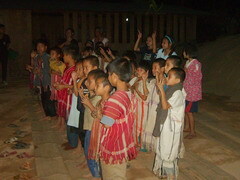 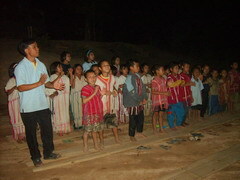 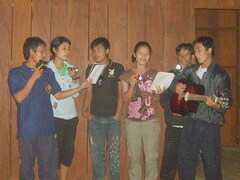 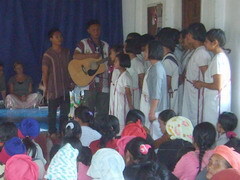 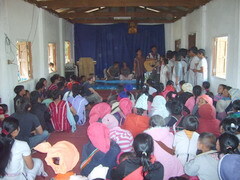 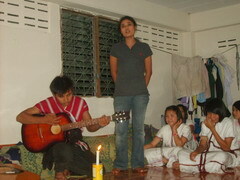 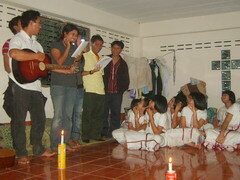 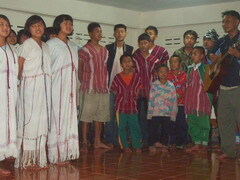 Our Coffee Hostel Children had chances to offer praise songs during the service. 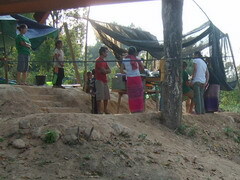 This is one of the Coffee Hostel purposes. 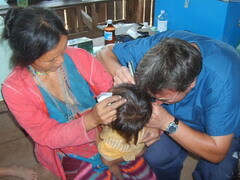 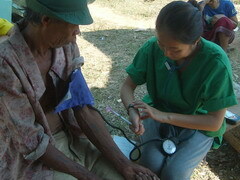 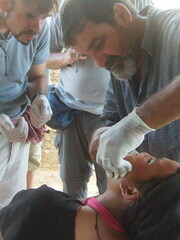 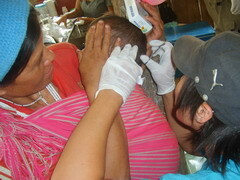 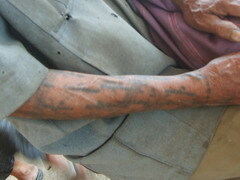 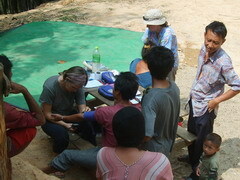 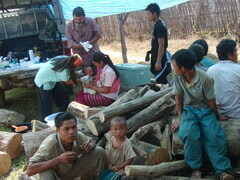 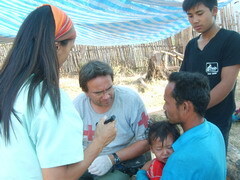 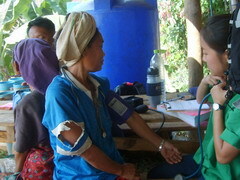 In the afternoon we gave medical care service to villagers. 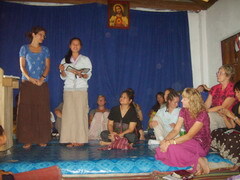 During the service the team took time to share a message in the village. 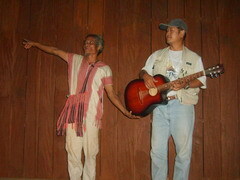 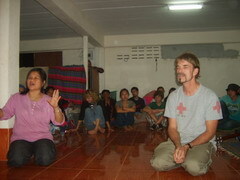 Dr. Viola spoke, interpreted by Miss Paw Thay Kee, with songs from the Medical Team, concluding with a speech by Friedhelm. 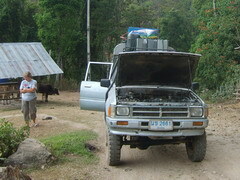 When we arrived Pa Ki Kee there was no water in Miracle’s (our truck) radiator because of a leak. 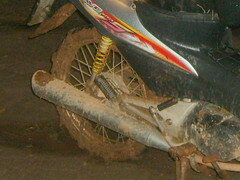 It caused no damage to the cylinder head and did not overheat. 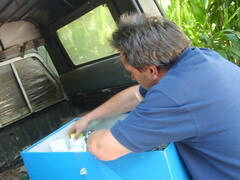 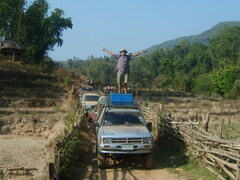 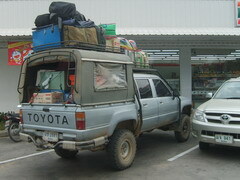 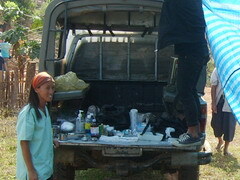 We asked Sompong, a member of our off-road teams, to take the radiator to Omkoi for repair. 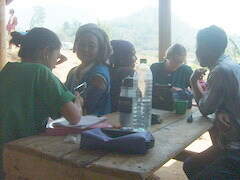 The children from the Coffee Hostel returned to Omkoi for school on Monday. 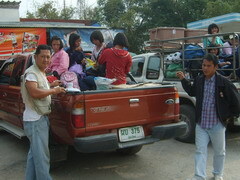 We asked Khun Wiboon to transport the children back, while we took Miracle for radiator repair. 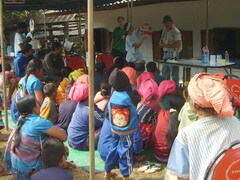 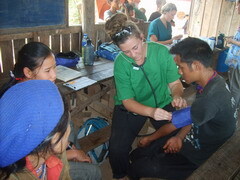 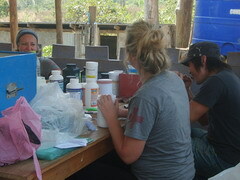 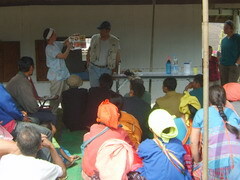 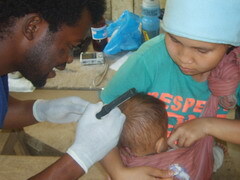 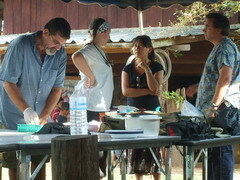 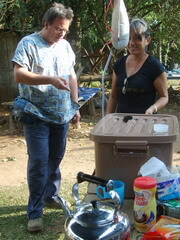 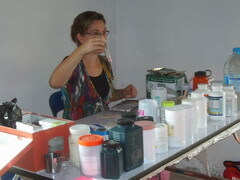 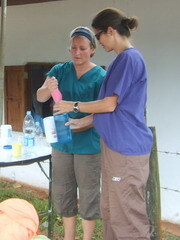 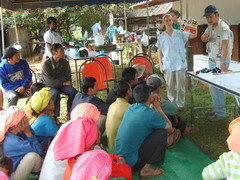 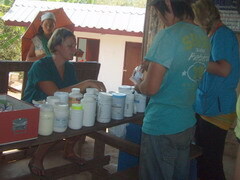 As we started the afternoon clinic time, the Team taught hygiene and nutrition to the patients waiting for examination. 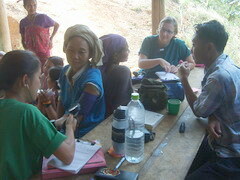 The coming of villagers for this second day of the medical service at Pa Ki Kee village afforded a chance for us to see a variety of dress styles from different villages. 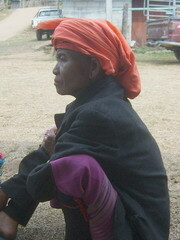 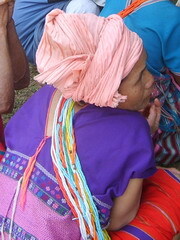 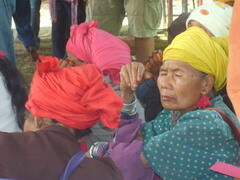 We saw many colors of cloth wrapped on women’s heads and wondered if different colors had specific meanings. 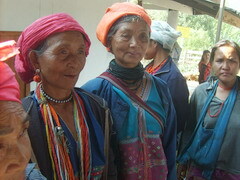 The women reported that there is no special meaning, just depending on their preference. 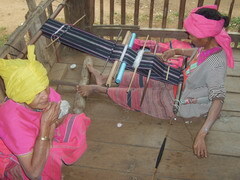 As in other villages they conserve their clothes and their weaving skills very well. 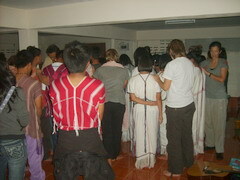 We learnt the different of clothes here. 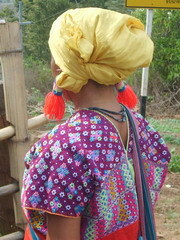 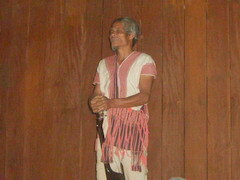 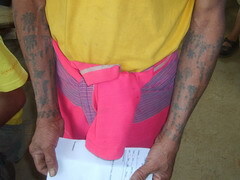 Poh Karen women’s blouse has feature on the shoulder but Sgaw Karen women blouse has no feature on the shoulder. 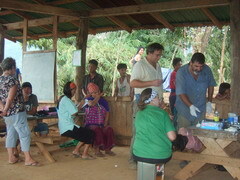 The first two days at Pa Ki Kee village people from other villages came to get health services, but today is for those living in Pa Ki Kee to get the service from the medical team. 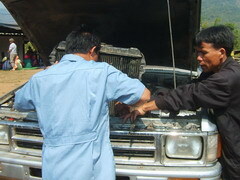 Today Miracle’s radiator come back, Sompong helping to put it back But finally we found that it still has a small leak. 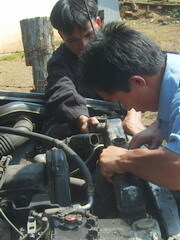 The reason was one side of radiator holder loses so the radiator bumps against engine’s fan. 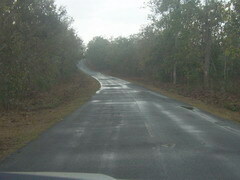 The beginning of unseasonal rain concerned us because the road we planned to travel would be dangerously slippery, especially if the rains continued for several days. 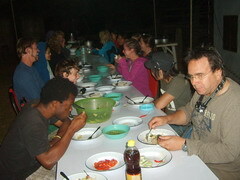 This evening we returned to Omkoi Coffee Hostel which is the center of villages in this area. 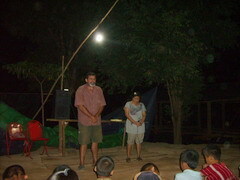 Dr. Mike shared a message with the children, interpreted by Auntie Air Poh, one of our team interpreters. 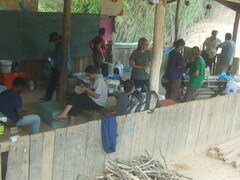 Our plan was to be at Maw Kler Kee Coffee Hostel this afternoon. 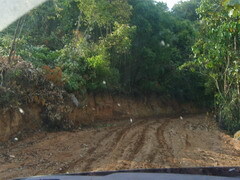 Actually the distance between Omkoi and Maw Kler Kee is not very far, but because of the condition of the road it took a long time. 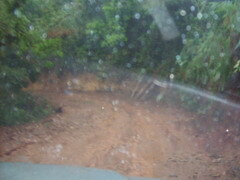 We departed Omkoi at 2 PM and didn’t reach Maw Kler Kee until 7:30 PM. 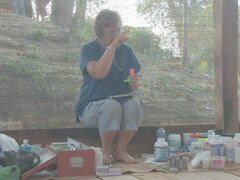 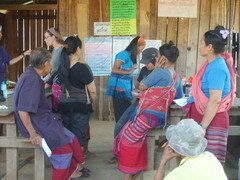 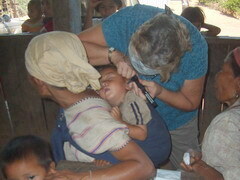 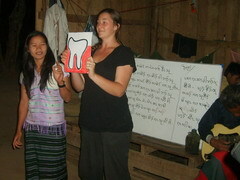 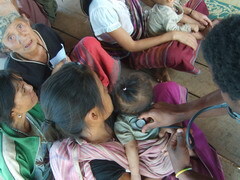 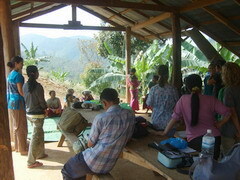 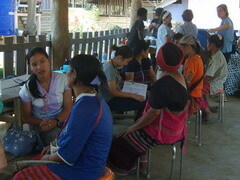 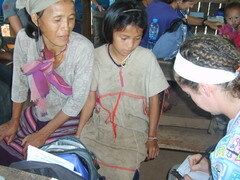 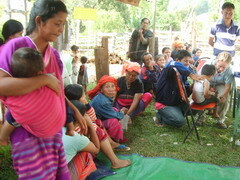 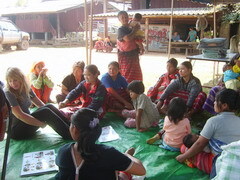 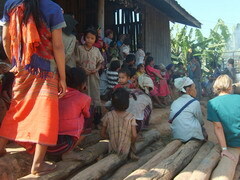 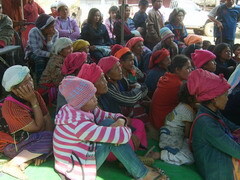 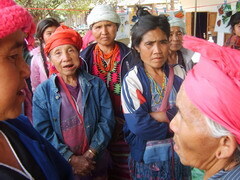 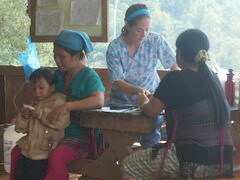 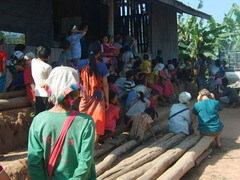 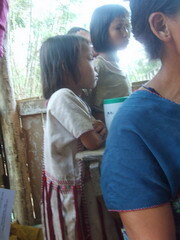 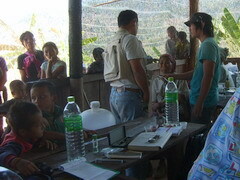 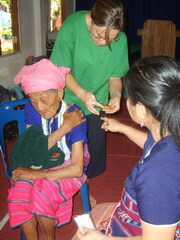 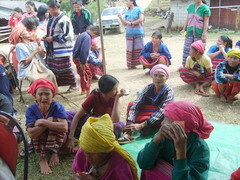 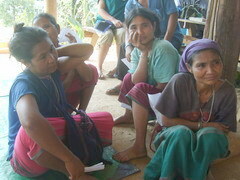 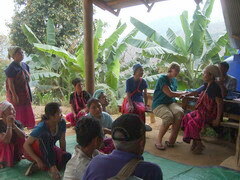 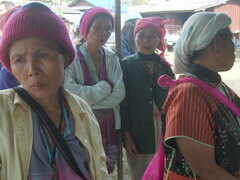 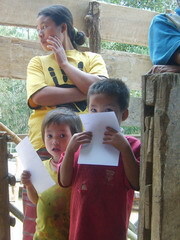 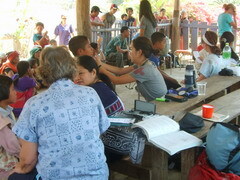 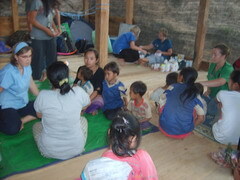 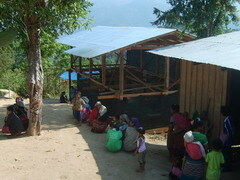 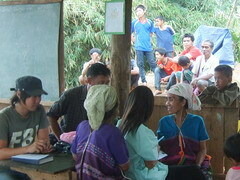 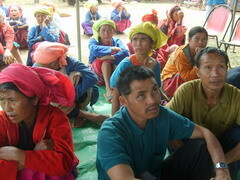 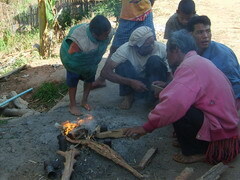 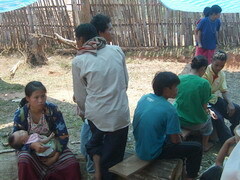 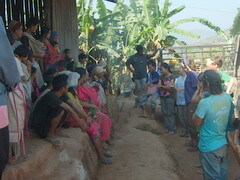 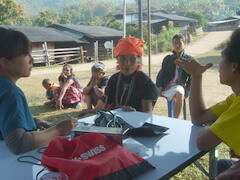 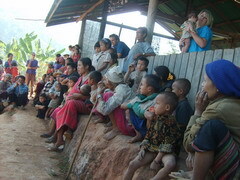 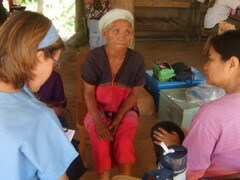 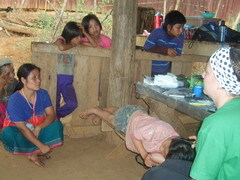 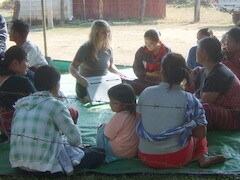 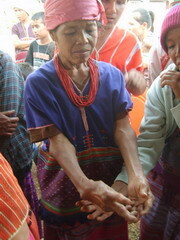 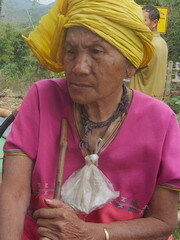 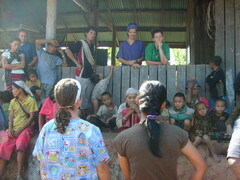 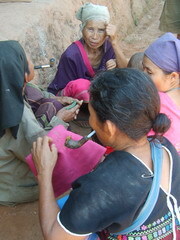 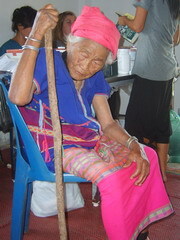 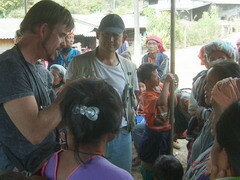 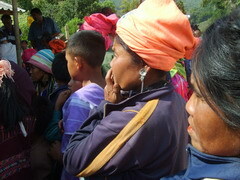 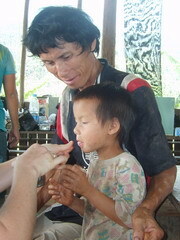 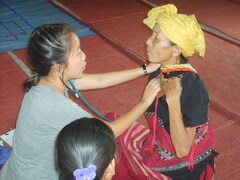 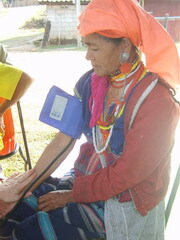 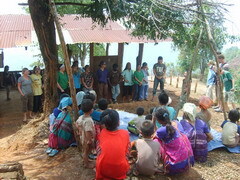 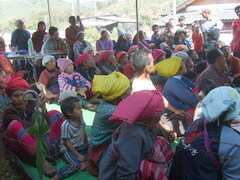 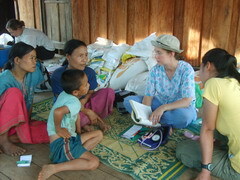 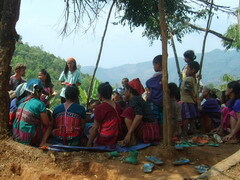 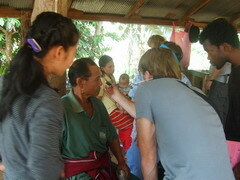 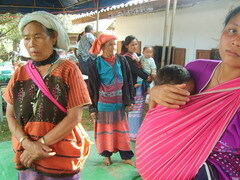 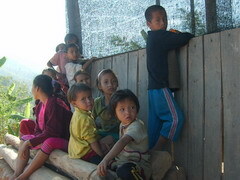 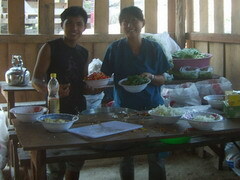 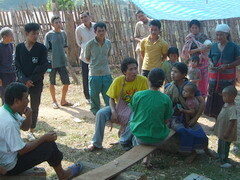 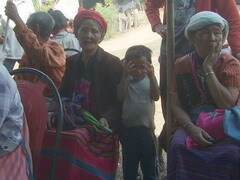 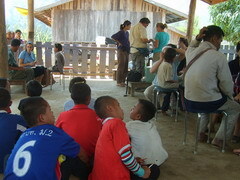 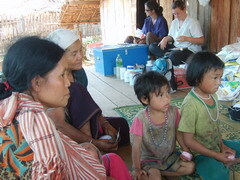 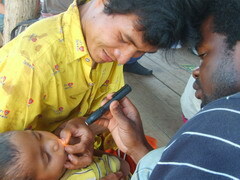 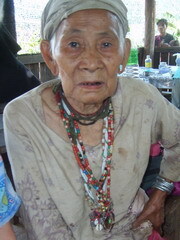 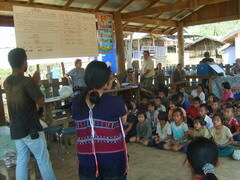 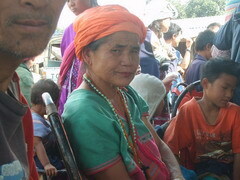 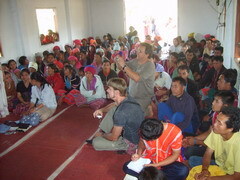 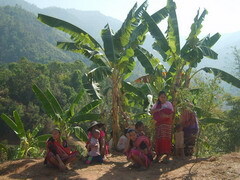 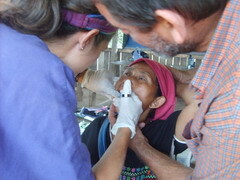 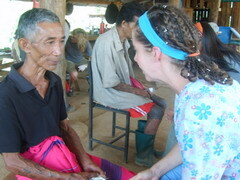 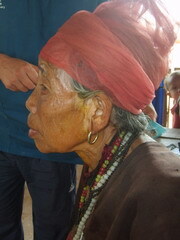 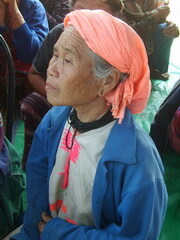 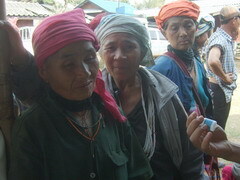 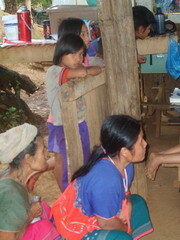 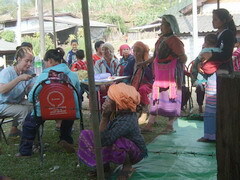 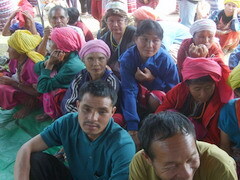 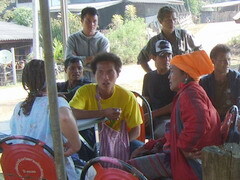 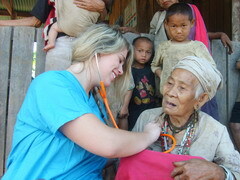 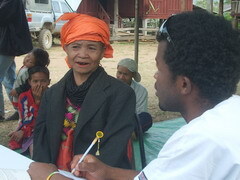 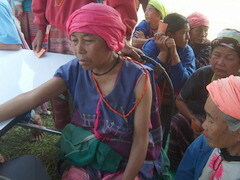 We informed Maw Kler Kee villagers that we would do healthcare service today. 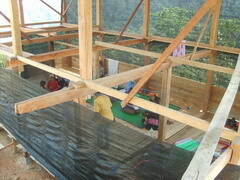 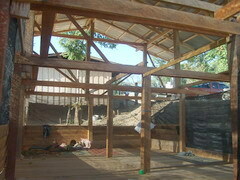 We tried to finish our hostel-church roof before the team arrived, in order to use the building for clinic and accommodations. 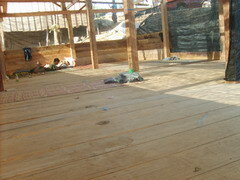 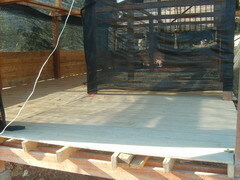 The first floor had only a temporary surface to use. 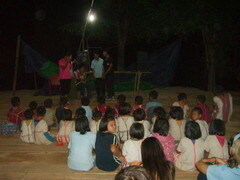 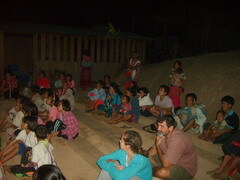 Most of our Karen Team was teachers and church elders, so we held a small show in front of our Maw Kler Kee hostel for children and villagers. 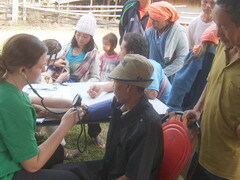 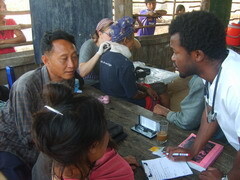 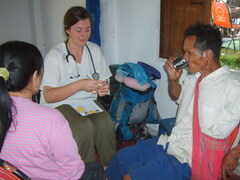 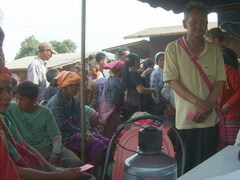 After breakfast at Maw Kler Kee Coffee Hostel we went to Maw Ko Kee village to conduct medical clinic. 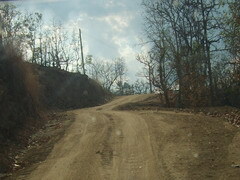 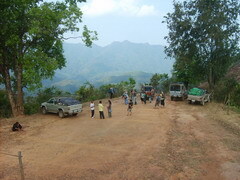 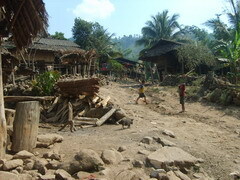 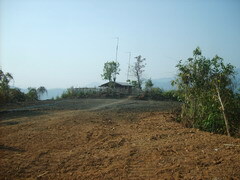 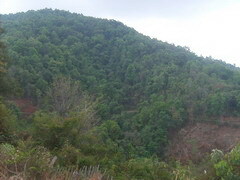 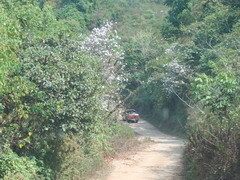 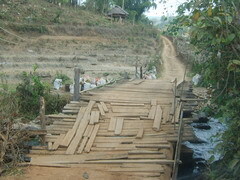 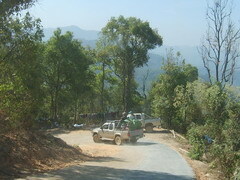 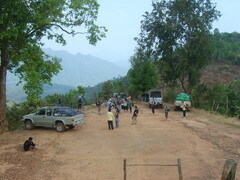 The road through Mae Ou Su district had been repaired quite well, but when it rains the road is damaged as before. 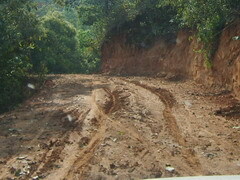 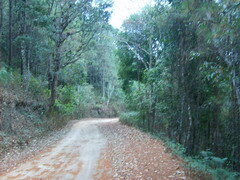 The road on the Omkoi side remained the same as last year. 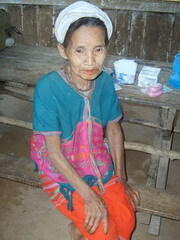 Someone came to tell us of a sick person who had not eaten for many days. 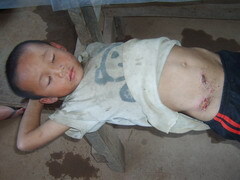 His wife and children were fatigued caring for him. 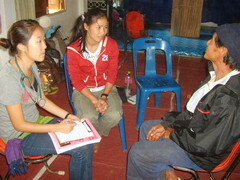 When we arrived at his house we discovered that he had visited the hospital, but they informed his relatives to take him back home. 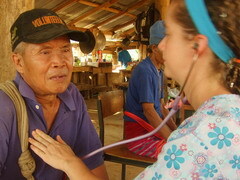 Dr. Mike and Dr. Viola could only encourage this old man and his family as his condition was terminal. 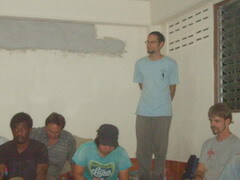 We prayed for him and left him in God’s hand. 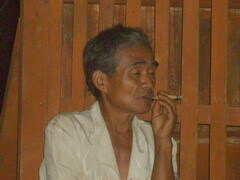 Two days we received news that the old man had passed away. 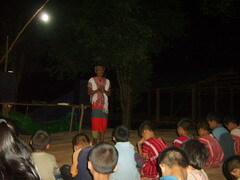 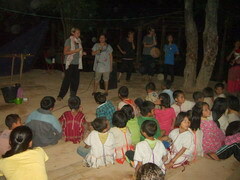 After dinner at Maw Kler Kee Hostel, Team teach about hygiene and nutrition at hostel’s front yard for children and villagers. 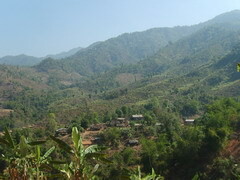 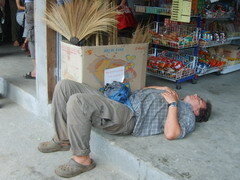 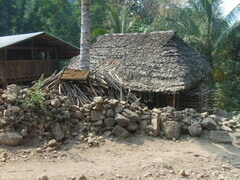 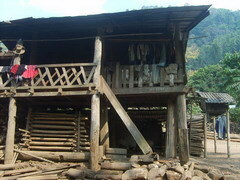 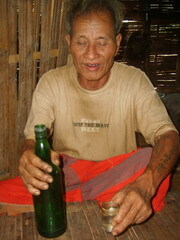 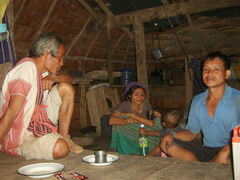 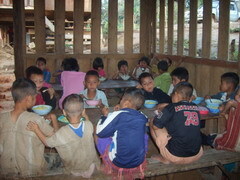 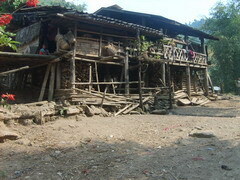 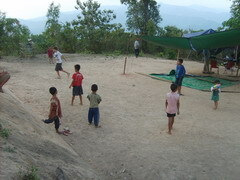 We settled down at Maw Kler Kee Coffee Hostel, go out from there to other villages and coming back each evening. 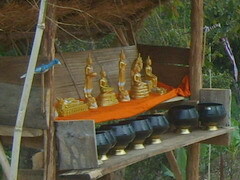 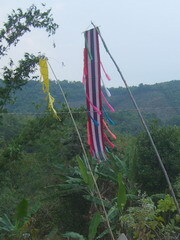 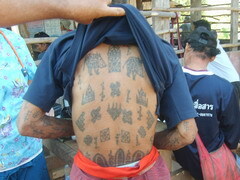 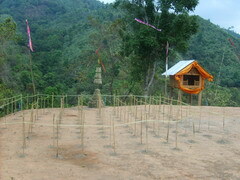 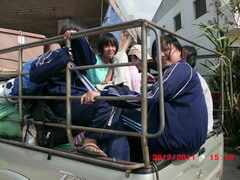 On this day we went to Tee Kaw Klo village. 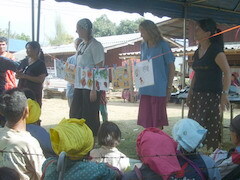 As usual, before medical service the team introduced themselves and instructed on hygiene and nutrition. 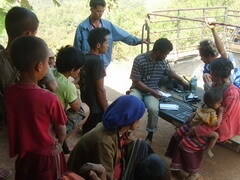 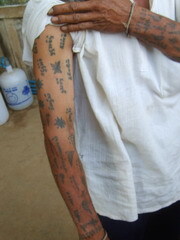 The most common symptoms among the villagers were various body pains, dizziness, feeling numb, shortness of breath, intestinal worms and gastritis. 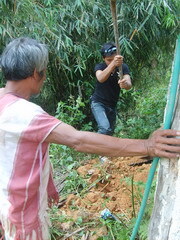 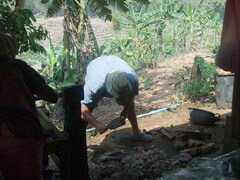 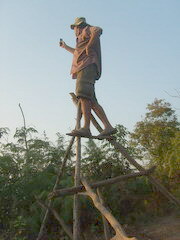 Most of the villagers work in the field, in the sun, doing heavy labor. 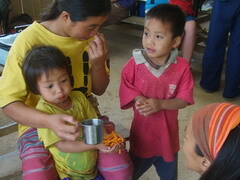 Their main food is rice and chili, and they usually drink very little of water. 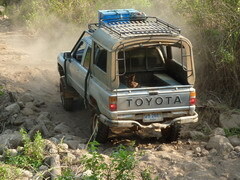 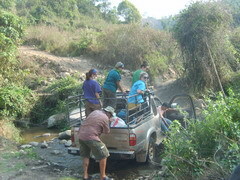 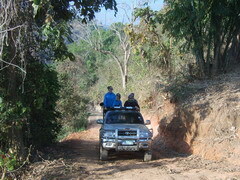 Although we used 4-wheel drive vehicles some parts of the journey were not easy. 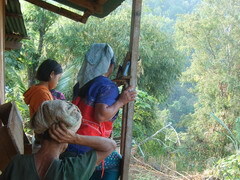 To contact the outside world villagers must come here to make phone calls. 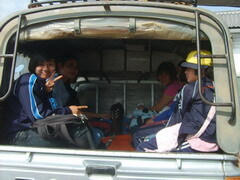 We transported friends who wanted to make phone calls here. 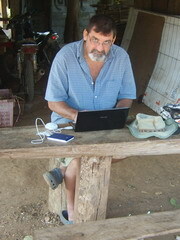 We discovered that in this remote area an older model mobile phone can function better newer models. 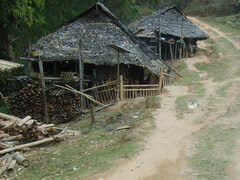 Houses here do not look like modern homes, but like these. 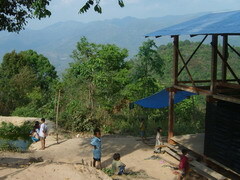 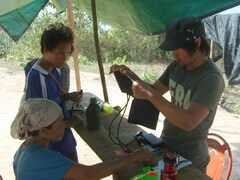 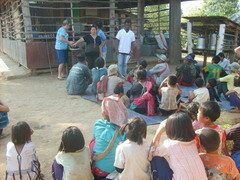 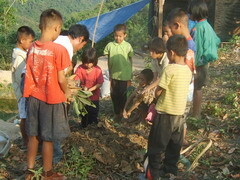 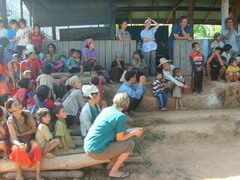 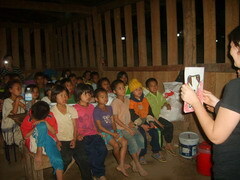 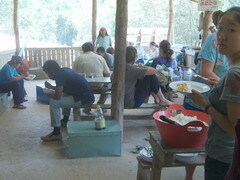 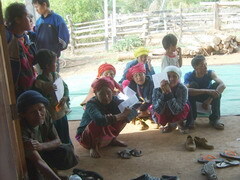 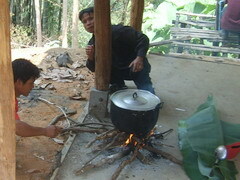 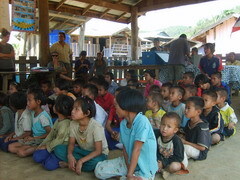 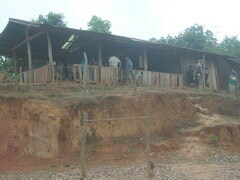 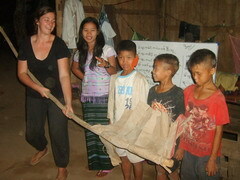 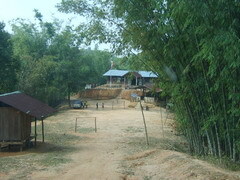 We went to Tha Jo Koh village to provide service, asking for permission to use village learning center. 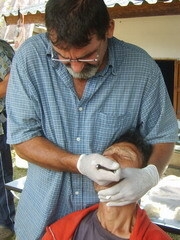 When there was no patient requiring dental extraction, our friend Mordecai would find something else to do. 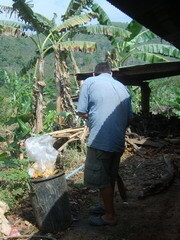 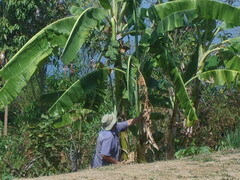 Here he is pruning the dried banana leaves from the trunk. 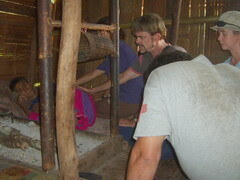 Here we met a woman who said she was very weak, maybe from worms. 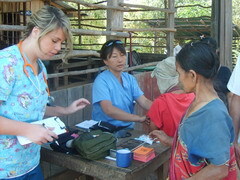 Before giving her deworming medicine she was asked if she was pregnant. 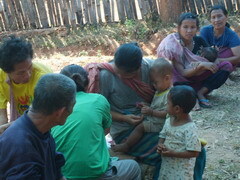 She answered, “Yes.” We asked, “How long have you been pregnant?” She said it was more than 2 years, and sometimes she felt her child move. 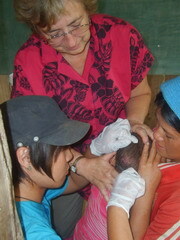 The midwife checked her and determined that she was not pregnant. 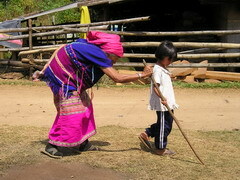 She insisted that her child was moving every week. 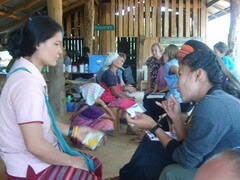 A pregnancy test showed that she was not pregnant. 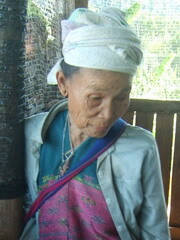 This was a superstitious belief that she was carrying a special pregnancy. 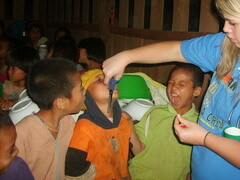 We just gave her some vitamins. 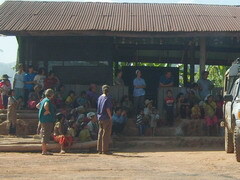 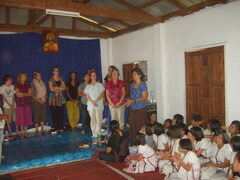 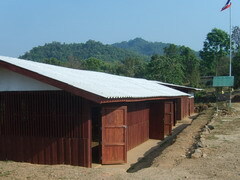 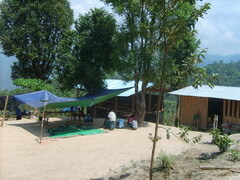 During our return to Maw Kler Kee Hostel we stopped at Maw Kler Kee school compound to see the changes. 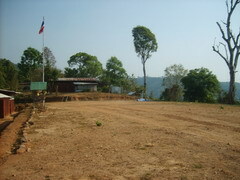 In 2009 our hostel was located here, but now the place was flattened and at least four new buildings are in the school compound. 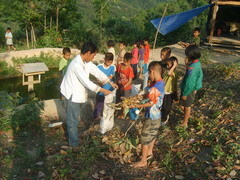 Mr. Wiboon, officer of Sub-District Administration Organization, traveled with us, teaching the children at Maw Kler Kee how to make compost (fertilizer) by using dry leaves mixed with cow manure, alternating layers of each, cover with sacks and keeping it wet. 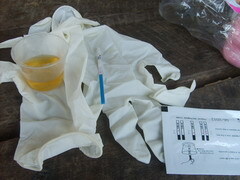 In two weeks this fertilizer can be used; very useful practical training. 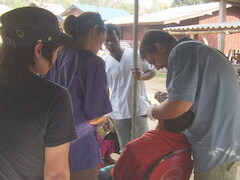 and distributed tooth brushes to the children. 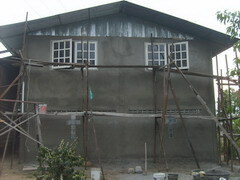 On this day the first floor of this building (boys’ dorm) was finished. 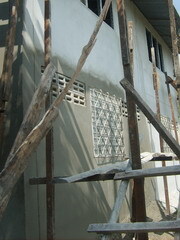 The second floor will be done later. 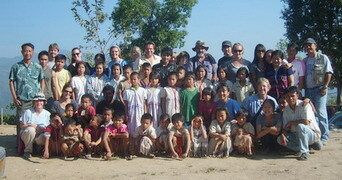 This was the last day with the Maw Kler Kee children, so before leaving we took a group picture with them. 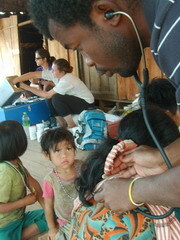 The season was changing to summer, and we had fewer patients than we expected. 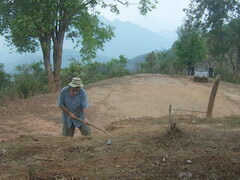 Some villages we have to reduce the service day. 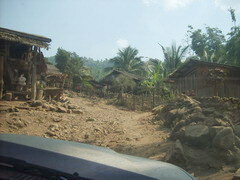 We had enough time to add more villages to our itinerary. 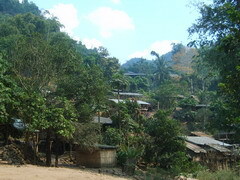 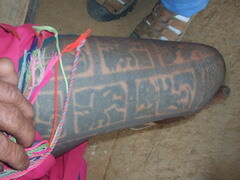 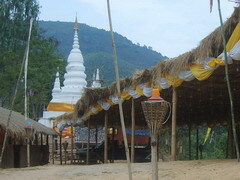 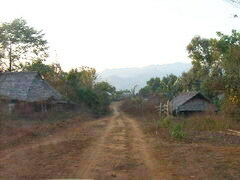 Maw Tee Tah was the first village we added to our original schedule. 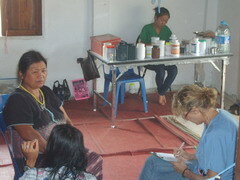 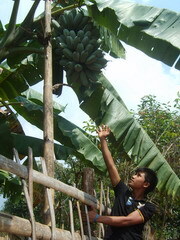 We learned from villagers that there are many more patients during rainy season. 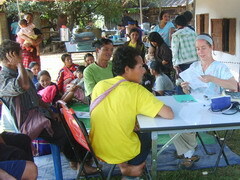 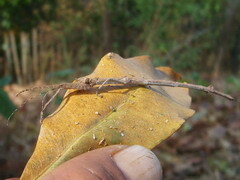 Many villagers die from dengue fever and malaria during rainy season because travel is very difficult and sometimes patients die on the difficult trip to the hospital. 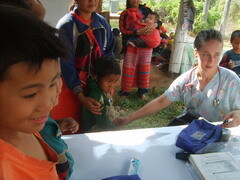 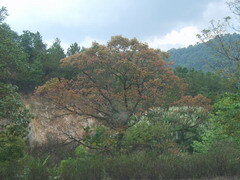 There are also many patients at the end of the rainy season and the beginning of winter, because of respiratory disease, cough and sore throat. 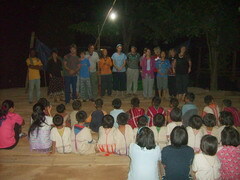 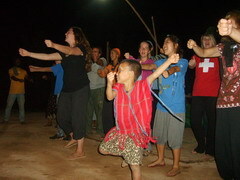 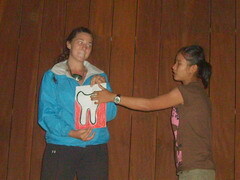 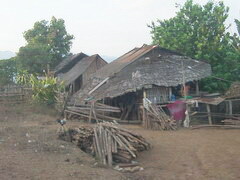 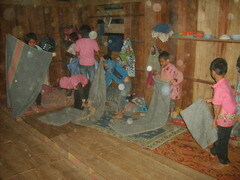 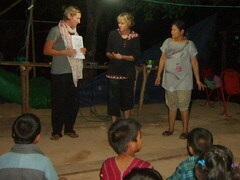 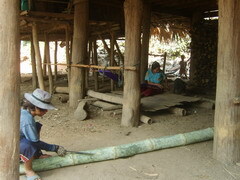 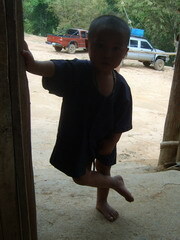 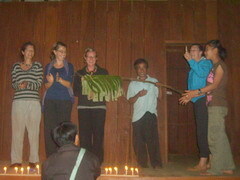 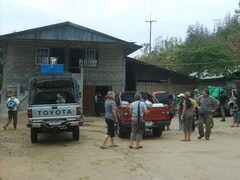 After we served at Maw Tee Tah village, we traveled to Ka Nae Ju Tah to spend the night there as we had planned. 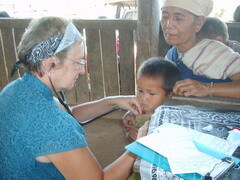 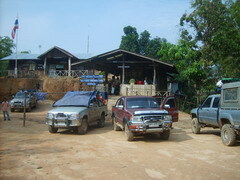 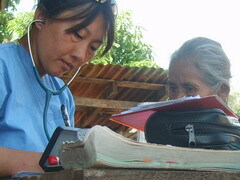 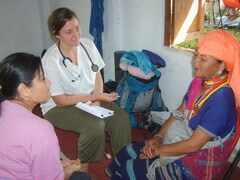 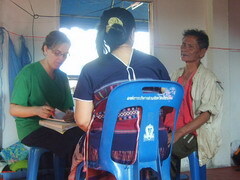 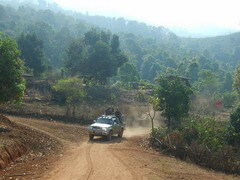 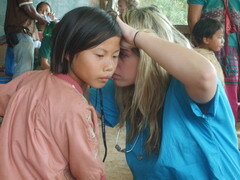 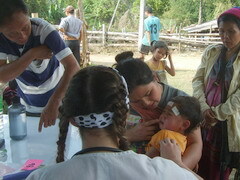 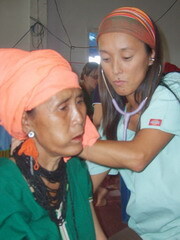 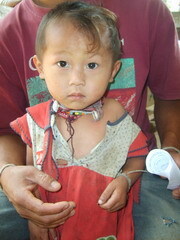 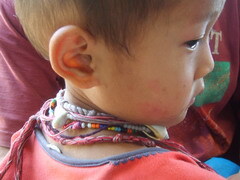 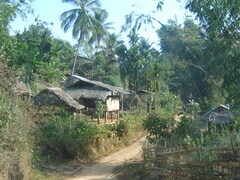 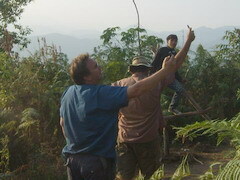 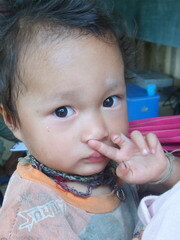 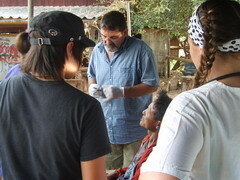 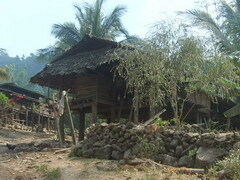 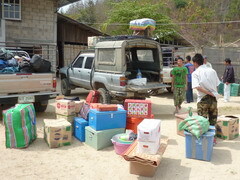 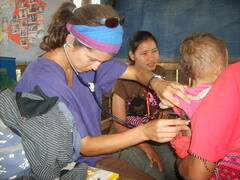 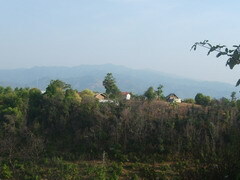 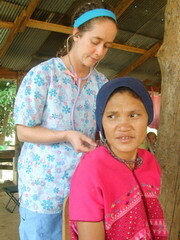 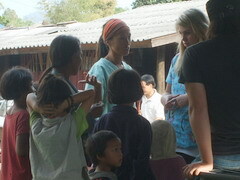 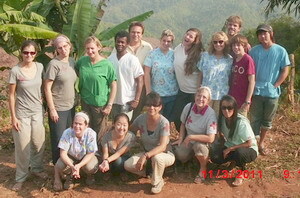 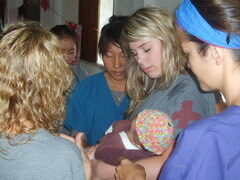 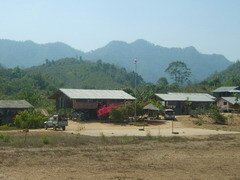 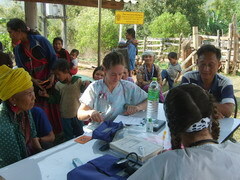 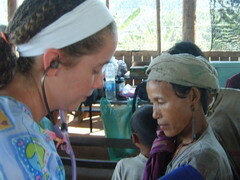 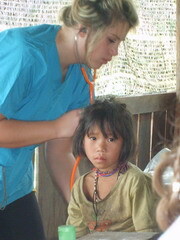 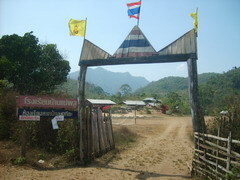 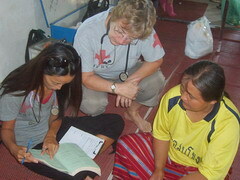 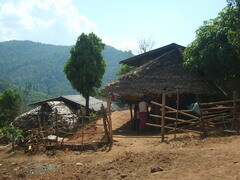 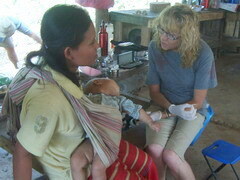 Actually we have passed Ka Nae Ju Tah village for two years, but this was the first time we did medical service there. 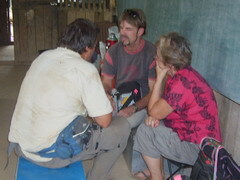 This trip we had the greatest number of Karen to help Friedhelm’s team. 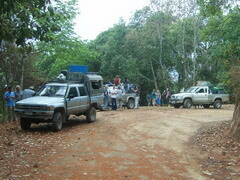 Because there were sixteen people in Friedhelm’s team, we had four 4-wheel drive trucks, four interpreters and our own chef. 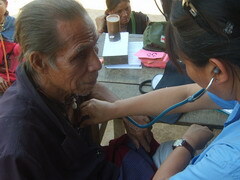 In the afternoon, when the number of patients started to decrease, we heard that at the next deeper village there were some older patients who could not come. 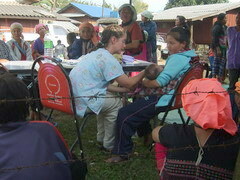 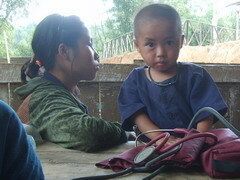 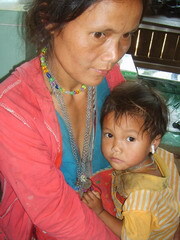 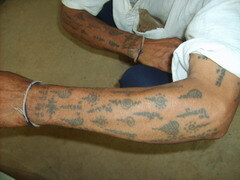 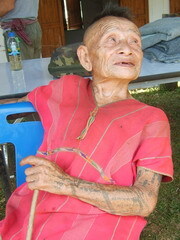 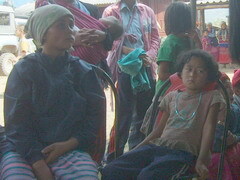 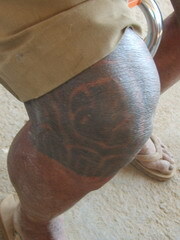 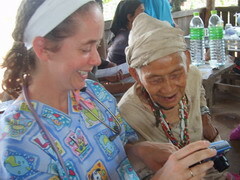 We went to Ler Bay Pwah Kee village to pick them up by truck and bring them to our mobile clinic. 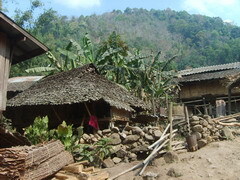 ”Live on the stone” is the meaning of this village’s name. 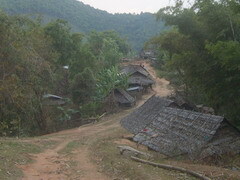 It is a proper name because there are plenty of stones in this village. 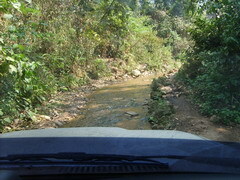 Maybe because of that it was difficult to build the road to this village, so we had to drive in the stream about 100 meters before entering to the village. 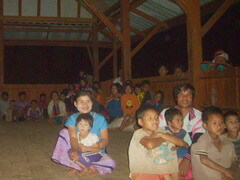 At twilight proved to be the best time to visit villagers. 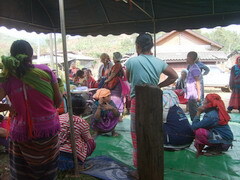 While the medical team was resting, Metal Drum Coffee Team went out to visit villagers at their homes to ask about their livelihood and to suggest they plant coffee for promoting extra earnings and to conserve the forest where they live and have their water and food resources. 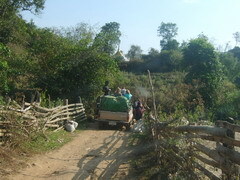 We noticed that this village had few patients, so after breakfast we added another village to our schedule, Thay Nah Der Looh. 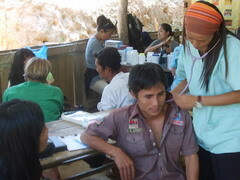 Again, we had often passed Thay Na Der Looh but never visited, but this time we provided medical service for the first time. 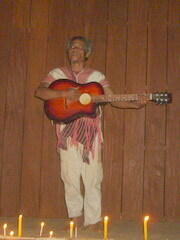 Our friend Mordacai was always busy. 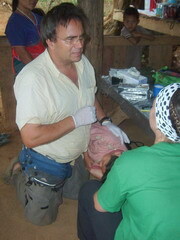 If he had no patient at the moment, he always found something to do. 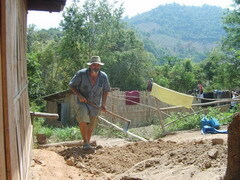 Here noticed that the dirt steps for the learning center didn’t look so good, so he stared to dig better steps. 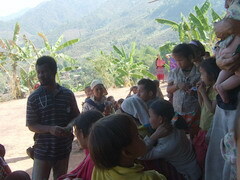 As usual before the team gives the medical service they introduce themselves to the villagers, then teach about hygiene before starting the healthcare clinic. 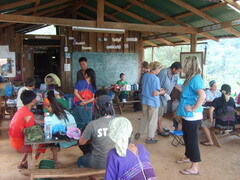 Behind this medical team, Anna, the chef prepared three meals a day. 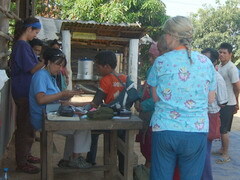 Pay Tru Pah and the Karen team helped so she didn’t work alone. 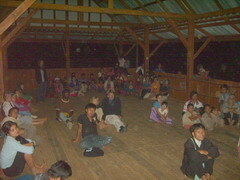 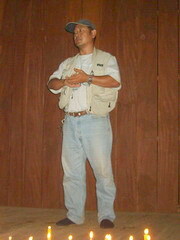 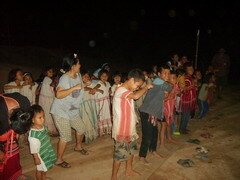 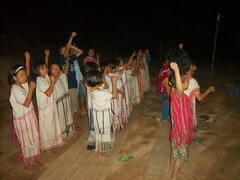 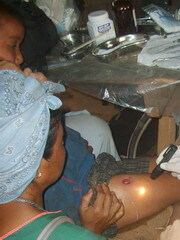 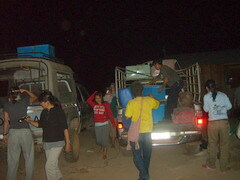 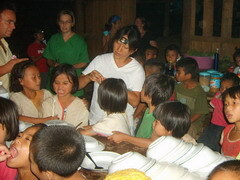 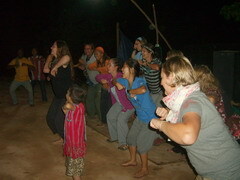 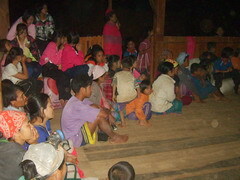 After the daytime medical clinic, the Karen team conducted evening activities. 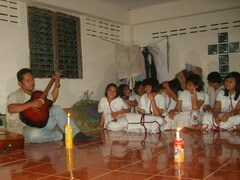 This was a surprise program. 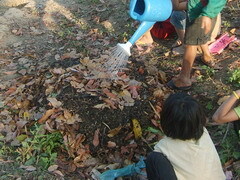 The Karen team had potential to do this kind of activity, because the team consisted of pastor, teachers, church elders, hostel father, Bible school students, and agriculture officer. 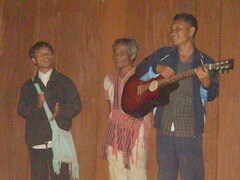 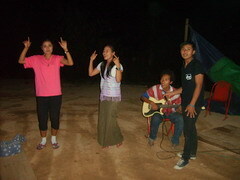 Our evening program was of Karen songs of various eras (depending upon the ages of the team), some Christian songs, medical team presentations about oral health, and encouragement of villagers to grow coffee for extra income and our assistance for marketing. 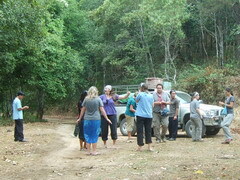 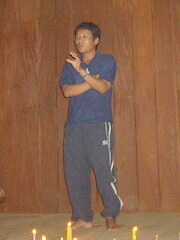 Wi Boon talked about what kind of environment coffee trees like, how to make organic fertilizer, and Thai law concerning villagers in the forest. 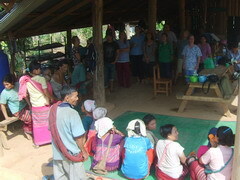 Pay Tru Pah shared his testimony, the medical team presented about health care and worms, and we closed with prayer and blessings by Pastor Taw Soe. 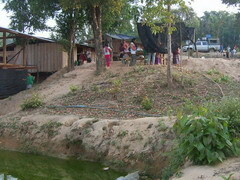 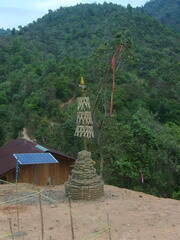 In Thay Nah Der Luh village there is mobile phone signal only at this one spot behind the village Learning Center. 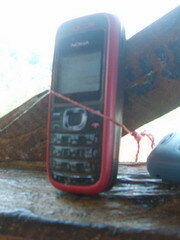 One must use an older model of mobile phone and must not move while making a call, otherwise it will disconnect. 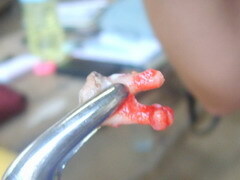 So the best way is put it down on that one spot. 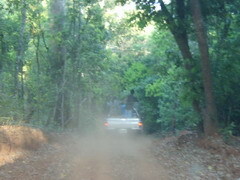 Some of the forests here are still very natural. 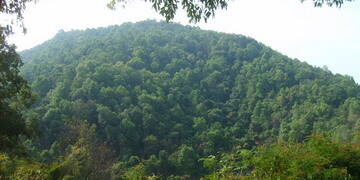 We don’t want these forest destroyed, and growing coffee actually helps these forests to remain and to increase. 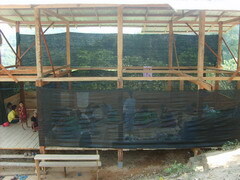 Because coffee trees need the shade from the bigger trees, coffee farmers must preserve these big trees to get the shade for their coffee tree. 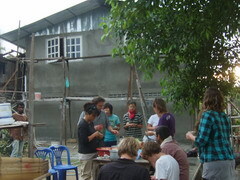 After breakfast the team went to Ka Nae Ju Kee village as planned. 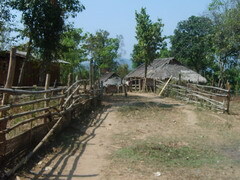 We have come to this village many years before, also. 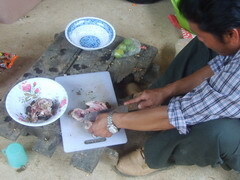 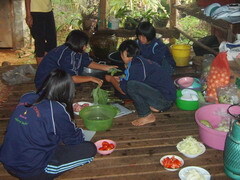 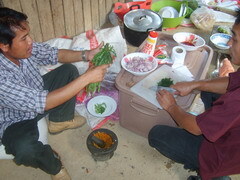 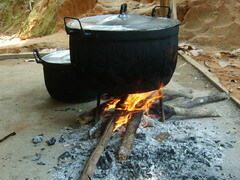 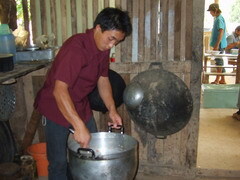 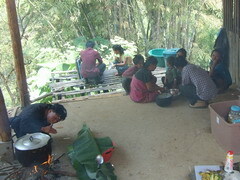 As soon as we arrived the Karen team started to prepare for lunch. 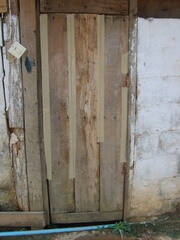 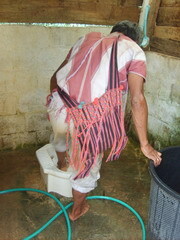 No toilets were ready to use, so it was necessary to solve that problem. 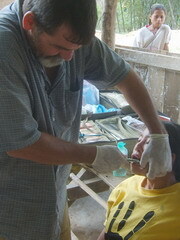 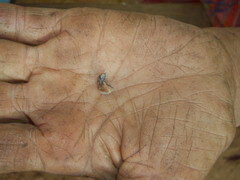 Mordecai said because of the roots of these teeth were swollen it was very painful. 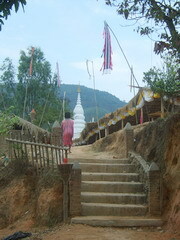 The pagoda at this temple was built since our last trip, and tomorrow will be a religious ceremony. 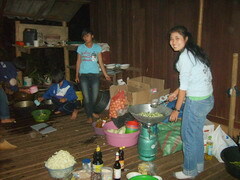 This evening we planned to have evening activities again. 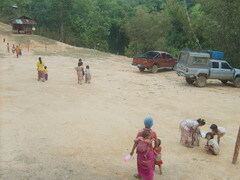 We intended to bring Maw Kler Kee Hostel children to come and sing in this village but on the way to fetch them from Maw Kler Kee it started to rain and it rained nonstop. 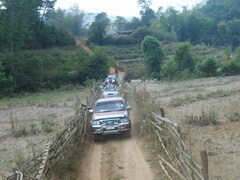 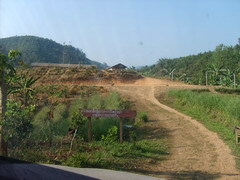 The clay road became increasingly slippery and before I reached Maw Kler Kee Coffee Hostel I knew that I could not safely return to Ka Nae Ju Kee village. 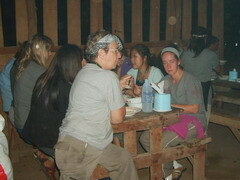 By then it was dark and I decided not to go back to Ka Nae Ju Kee. 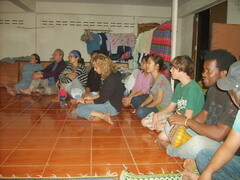 While I was talking with Maw Kler Kee Hostel parents in the kitchen about 7 PM children in the hostel heard one of their friends scream with fear from outside. 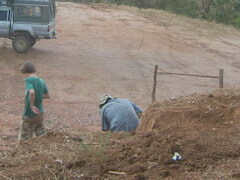 We saw children run to the front yard so we went to see what happened. 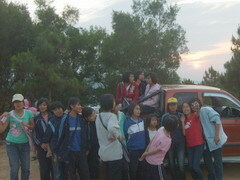 Naw Pae Wa was crying there. 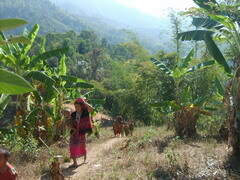 She told us with the tears, quivering, and sobbing that after she had come out from the toilet she came beside the water tank and looking down toward the valley she saw shadows of people without heads waking toward her. 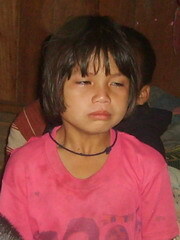 It took some time to learn what had happened because she was crying and sobbing. 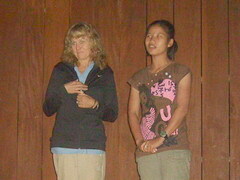 After we had brought her back into the hostel Pastor Taw Soe prayed for her, and the hostel children prayed The Lord’s Prayer after which she stopped crying. 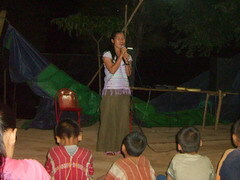 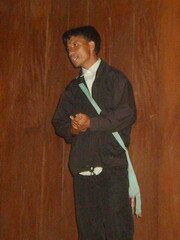 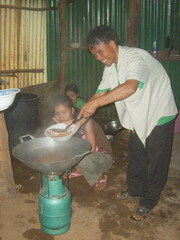 Pastor Taw Soe said that this girl was not usually a fearful girl. 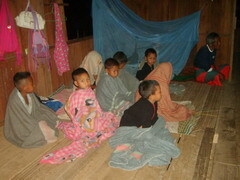 That night I slept the in the same building with the children, and I noticed that the room was completely dark. 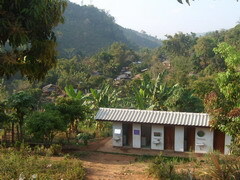 Next morning I suggested that Pastor Taw Soe put a light in front of the toilet and leave it switched on the whole night, so the hostel bedroom would not be so dark at night. 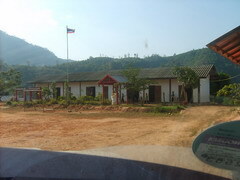 ในขณะที่นั่งคุยกับพ่อบ้าน และแม่บ้านหอพักกาแฟมอเคล่อคีในห้องครัวอยู่ เวลาประมาณ 1 ทุ่ม เด็กในหอพักได้ยินเสียงกรีดร้องของเพื่อนด้วยความกลัวจากข้างนอกหอพัก เด็กๆจึงวิ่งออกมาหาเพื่อนที่ลานข้างหน้าหอพัก เราเห็นเด็กๆวิ่งออกมาเราจึงวิ่งออกไปดูว่าเกิดอะไรขึ้น เธอยังคงร้องไห้ด้วยความกลัวอยู่ที่นั่น พวกเราจึงถามเธอว่าเกิดอะไรขึ้น เธอเล่าทั้งน้ำตา, น้ำเสียงที่สั่นเครือและสะอื้นว่า หลังจากเข้าห้องน้ำแล้ว เธอไปยืนที่หลังแท้งน้ำแล้วมองลงไปในหุบเขาหลังห้องน้ำ เธอเห็นเงามืดที่ไร้หัวเดินกำลังเดินขึ้นมาหาเธอ กว่าพวกเราจะรู้เรื่องราวก็ใช้เวลาพอสมควร เธอยังคงร้องไห้สะอื้น หลังจากพาเธอขึ้นไปบนหอพักแล้ว อาจารย์ถ่อโซอธิฐานเผื่อเธอและเด็กๆอธิฐานตามคำอธิฐานของพระเยซู เธอก็หยุดร้องไห้ อาจารย์ถ่อโซเล่าให้ฟังว่าเด็กคนนี้ปกติเด็กคนนี้ไม่ใช่คนขี้กลัว จากนั้นเด็กๆก็แยกย้ายกันไปนอน คืนนั้นผมนอนห้องเดียวกับเด็กๆ ผมสังเกตว่าห้องนอนเด็กมืดมาก ผมจึงให้พ่อบ้านหาหลอดไฟมาติดไฟหน้าห้องน้ำหนึ่งดวงและเปิดไว้ตลอดคืน ห้องนอนของเด็กจะได้ไม่มืดจนเกินไป. 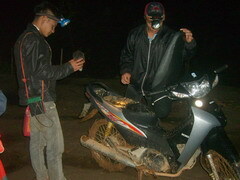 About 9 PM I heard the sound of a motorcycle engine. 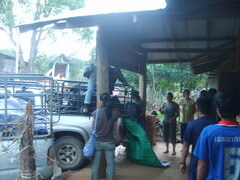 Sompong, one of our Karen team, had borrowed a Ka Nae Ju Kee villager’s motorcycle to check on me because I did not return as planned. 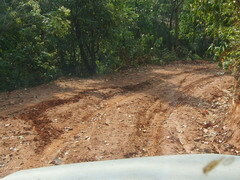 Sompong said the road was very slippery. 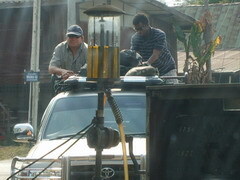 He was only able to come by putting a chain on the tire. 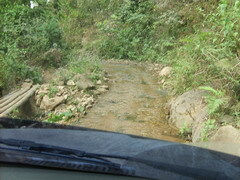 After waiting until the sun could dry the road I drove back to Ka Nae Ju Kee. 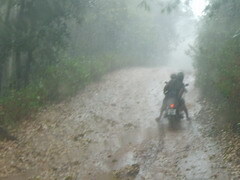 Weather like this makes it very difficult to plan trips into the mountains. 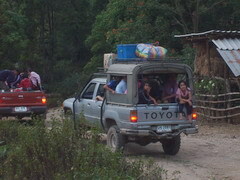 We left Ka Nae Ju Kee at 10 AM, reaching Omkoi at 2:30 PM. 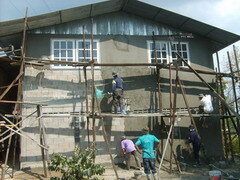 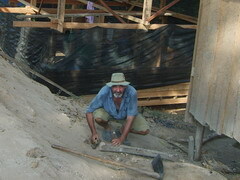 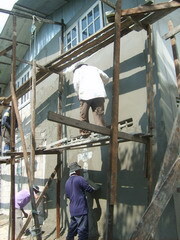 Upon arrival we found the builder plastering the Omkoi hostel outside wall. 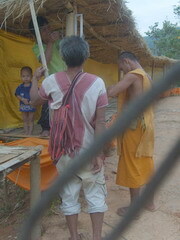 ฤดูกาลที่แปรปรวนอย่างนี้ คงจะทำให้การวางแผนในการเดินทางของเราในอนาคตยากขึ้น เราออกเดินทางจากคะแนจื้อคี ประมาณ 10.00 น และกลับไปอำเภออมก๋อย ในเวลา 14.30 น. 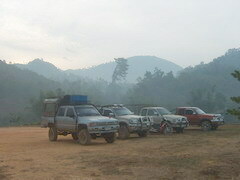 We arranged another three trucks to send the team just to Omkoi, but to save money the team would then travel by bus from Omkoi to Chiangmai. 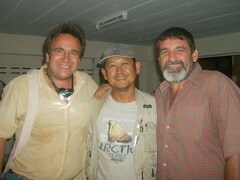 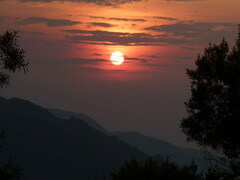 We stayed at Omkoi one more night and the team rested this afternoon. 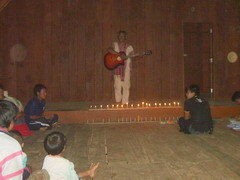 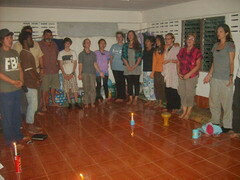 In the evening the team joined the evening service at the hostel. 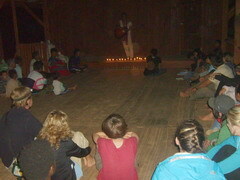 But that evening Omkoi had no electricity, so for the hostel service we had to use candle light. 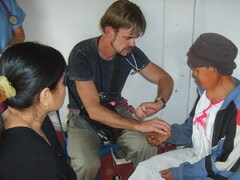 The service was closed by the medical team praying for the Coffee Hostel missions and those who are concerned. 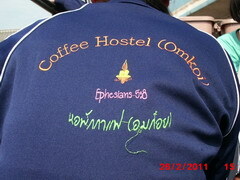 After breakfast the bus came and picked the team up at Coffee Hostel. 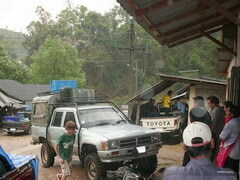 But the team leader and the luggage traveled by Miracle (our truck). 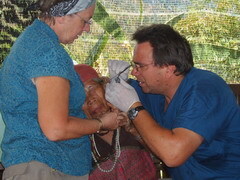 Thanks to Dr. Roger Butz for revisions.